This link will take you to our secure Paypal page. Please indicate that you wish for your gift to support the World Ocean Explorer project. WORLD OCEAN EXPLORER is an educational gaming experience, free for use in the classroom and at home by ocean enthusiasts ages 10 and up. 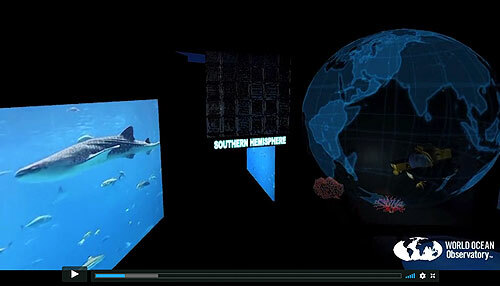 Simulate a walk through a deep ocean aquarium, find marine species rarely seen; engage with ocean systems; click through to educational content and curriculum; and board a manned submersible for exploration of a variety of ocean environments. Aboard the submersible, complete goal-driven mission scenarios or conduct free-play explorations. Choose a locale: a polar sea, a tropical coral reef, a hydrothermal vent at the deepest depths of the ocean, a shipwreck on the seafloor, an oil spill at an offshore rig...all the while gathering samples and data for use in the classroom! Inspired by the Next Gen Science Standards and the Ocean Literacy Curriculum, WORLD OCEAN EXPLORER is an immersive gaming experience designed to excite students about scientific ocean exploration and to promote ocean literacy worldwide. WORLD OCEAN EXPLORER is designed to increase ocean literacy and interest in ocean fields of study. Visitors will be able to engage with the marine environment through interactive displays, learning about species and habitat not otherwise available for display in an aquarium setting. ...and conduct environmental assessments such as contamination events and ecosystem health. The manned submersible will be equipped with an array of instrumentation to allow for physical, chemical, biological and geological investigation. Data and images collected during game play will be stored and can be exported via .txt or .png files for qualitative and quantitative use in the classroom. Our ecosystem modules will encourage goal oriented activities and open discussion toward solving ocean problems and developing a better understanding of ocean systems and health. World Ocean Explorer, which will be made available to users around the globe, is designed to excite students about the infinite possibilities associated with ocean exploration. The goal of this project is to distribute Explorer in traditional classroom and home school environments (via laptop or PC) with future expansion to include additional educational modules and the potential for a virtual reality experience. World Ocean Explorer is designed for ease of use, download, and cost efficiency. World Ocean Explorer will utilize Steam (steampowered.com), a digital distribution platform, as well as direct downloads through our website (worldoceanobservatory.org) to deliver Explorer to classrooms. Explorer will be available absolutely free of charge to any educator who wishes to increase ocean literacy and foster interest in ocean systems in their classroom. The game is being developed using Unity, a cross-platform game engine. For use on Windows or Mac platforms. Thank you for considering a gift of support for the World Ocean Explorer project!